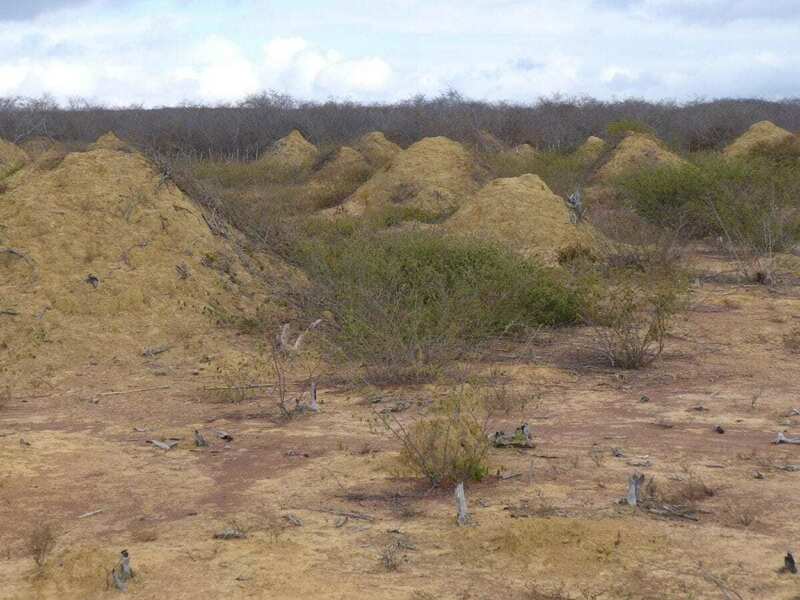 Researchers have found that a vast array of regularly spaced, still-inhabited termite mounds in northeastern Brazil–covering an area the size of Great Britain–are up to about 4,000 years old. The mounds, which are easily visible on Google Earth, are not nests. Rather, they are the result of the insects’ slow and steady excavation of a network of interconnected underground tunnels. The termites’ activities over thousands of years have resulted in huge quantities of soil deposited in approximately 200 million cone-shaped mounds, each about 2.5 meters tall and 9 meters across. The mounds are largely hidden from view in the fully deciduous, semiarid, thorny-scrub caatinga forests unique to northeastern Brazil. They’d only really come into view by “outsiders,” including scientists, when some of the lands were cleared for pasture in recent decades. Soil samples collected from the centres of 11 mounds and dated indicated that the mounds were filled 690 to 3,820 years ago. That makes them about as old as the world’s oldest known termite mounds in Africa. The researchers investigated whether the strangely regular spatial pattern of the mounds was driven by competition amongst termites in neighbouring mounds. Their behavioural tests found little aggression at the mound level. That’s compared to obvious aggression amongst termites collected at greater distances from one another.